The American firm of Questar has a great reputation making telescopes, and still make among the world's finest. 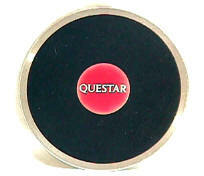 When Questar turned their considerable expertise to a camera lens, they came up with the Questar 700/8. 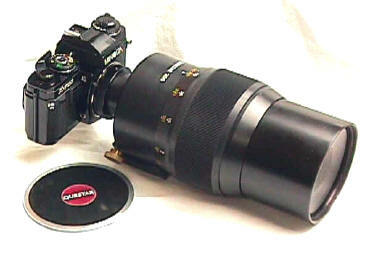 This is a T mount lens, which means it can be adapted to virtually all 35mm SLRs just by changing the rear adapter. 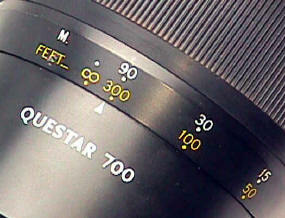 When tested by Modern Photography in the 1970's, the Questar 700/8 was rated the best mirror lens they had ever tested. 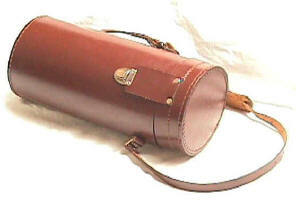 Note the metal Questar front cap and Questar leather case. The tripod mount is removable and rotatable. Close focus is a macro-like 10 feet. 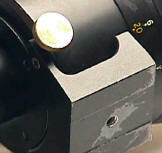 Lens focuses though its range, but will focus past infinity to allow for heat expansion. Marked in both meters and feet. This is an early collectible example, # 10067 marked "PAT. PEND." Front filter size is that ever popular and economical favorite, 95mm.